Comfortdelgro to buy Buslink pty ltd and Buslink Southern pty ltd and their 11 depots for $190M subject to approval. Stu wrote: ^ As Fleet Lists stated - 'rumor'. It could be possible that such a rumor has been created due to the number of acquisitions that CDC have made recently and all in a very short space of time, this could make people think 'who's next?' or 'I'm next'. It's no secret that CDC is shopping around to expand. Guess it is just a matter of them making offers that are "too good to refuse" to sway the owners into selling. INCREDIBLE pictures show hundreds of furious Sydneysiders being forced to wait over an hour for buses which are supposed to come every three minutes. ANGER is brewing after Sydneysiders were forced to wait over an hour to get on buses which should arrive every three to five minutes. Incredible pictures on social media show lines of hundreds of disgruntled commuters lining up in the city’s northwest as they attempted to get to work this morning on Hillsbus services. They lashed out at transport chiefs, who said the chaotic scenes were caused by “driver absences” after yesterday’s Melbourne Cup. Several said they had to wait over an hour for a bus and took to Twitter to express their anger. #hillsbus are you serious right now? People are getting off busses but can't get on because they're all too full. What a waste of an hour. Hillsbus services are currently experiencing disruptions due to an unexpected level of driver absences. Delays may be experienced. Allow plenty of extra travel time. The situation wasn’t helped when transport information service Buses North West tweeted at 8am — to tell customers of the disruptions. There's a decent percentage of Hillsbus drivers that are of Indian decent and the date for Diwali in 2018 is right smack on Wednesday, November 7. So maybe that could've been why there were the reported absences. Maybe this, maybe something different. Everyone has their own circumstances. It could of been a combination of various factors for CDC. Isn’t STA’s Ryde Depot have a fair amount of drivers of Indian decent so Diwali would have affected them as well. One TV news report last night claimed it was industrial action related to outstanding pay claims. there appear to be new Hillsbus timetables for all their routes as from 12th November 2018 but no news as to what the changes are. Rouse Hills new southbound T-way bus stop opens at 5am on Tuesday 13th November. Region 6 rumours. Re-route, new route/s and some loop services. It could be possible that the alleged loop services could be modified existing routes, I doubt that a bunch new shopper hopper routes or demand services are implemented. Stu wrote: Region 6 rumours. Re-route, new route/s and some loop services. It could be possible that the alleged loop services could be modified existing routes, I doubt that a bunch new shopper hopper routes or demand services are implemented. That almost sounds like a mini region review! Is the 460 going to turn into an On Demand service? It is their first review of the region routes since takeover and I suspect not the last one with more to take place next year, No details have been released at this stage. This has been speculated since day one so to speak as this service doesn't carry many passengers, however at the moment both the 460 and on demand services operate in the same catchment area so it would be interesting to see data regarding patronage levels for route 460 since July 1st. There are many routes that have not had a major timetable change since 2010, whilst some other routes have had minor changes although remain at the mercy of heavy traffic causing reliability issues. Attention should be given to routes 308, 401, 436, 444, 445, X25, 526 and some other city services. There have been rumours for some time about routes 415 & 492 being truncated at Burwood, if the rumour was true I think that it has been put on the shelf for a while as there have been a number of other large service changes in a short space of time across Sydney. The route 530 duplicates both routes 415 & 492 between Burwood and Drummoyne. The route 490 should remain as it operates the same path as route 492 from Burwood to Five Dock, on its own path via Rodd Pt and the the same path as 492 & 530 from Russell Lea to Drummoyne. - 490: current early morning and late night services only operate as short working trips. 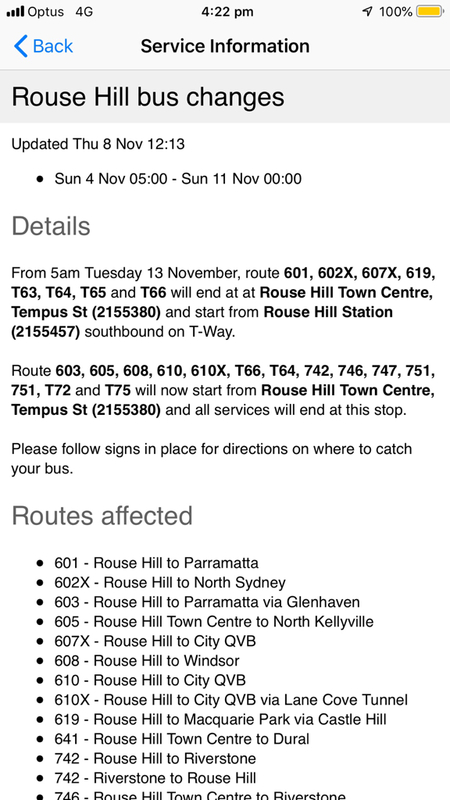 - 492: would continue to operate trips to and from Drummoyne early morning and late night as the are now. Overall, the 490 would be unchanged and the 492 would be truncated from AM peak until PM peak, other timetables trips would remain relatively unchanged. - 415 truncation at Burwood (from Campsie) would require a new route to maintain the service connection between Chiswick and Burwood. This serevive should be re-routed via Canada Bay to avoid congested traffic on Parramatta Rd and unnecessary duicwruon with routes 461 & 530. - Lay over space at Burwood Westfield in its current state would not support routes 415 & 492 terminating here. It would be possible to have a proposed service from Chiswick to Burwood terminate in Railway Pde as there is plenty of room there. Yeah 460 seems like one of those Community Service Obligation routes like the 341 and 342 around Kingsford that would be better served by On Demand services. Out of curiosity, was the X25 originally funded by Commbank for its Olympic Park employees? I remember someone mentioning the 533 was originally set up like this? Unfortunately it also seems to be way underutilised when compared to the all stops services. ^ I don't recall the X25 being funded by the Comm Bank, I wouldn't rule it out. It wouldn't surprise me if the Sydney Olympic Park Business Association lobbied both the Sydney Olympic Park Authority and TfNSW on behalf of businesses in the area. The route 533 may have originated from TfNSW planning strategic routes linking regions, business hubs and transport connections. I know the 308 has some congestion issues along the route from Marrickville Metro to Redfern during the peak. Nothing can really be done surely. If its north of Redfern off-peak would it be better to terminate at Railway Sq like the 309-310 and/or run direct into CBD via Regent & Lee St or permanently terminate at Redfern. ^ Terminate the 308 at Redfern would be a good idea as there plenty of other City bound services from Redfern to City (305, 309 & 310) plus 343 & m20 from Chalmers St near Phillip St - such a change would make the 308 a permanent short route. Considering that Wyndham St & Gibbons St, Redfern heading North are One Way and Regent St, Redfern is One Way heading South, the service could be made into a loop. During the consultation period for Region 6 service changes in 2010, there were a number of locals from the Inner West who wanted the reinstatement of the route 470 services that deviated to Leichhardt Marketplace or to have services that would normally finish at Lilyfield to extend to Leichhardt Marketplace, maybe the govt can implement a shopper hopper service from Lilyfield to shore up some votes before the next election. In thinking of the 308 the only issue with it terminating at Redfern is some locals would complain that Redfern has poor wheelchair access & is not very friendly for less mobile people. A few 305 trips currently terminate at Redfern. Don't worry about a bus from Lilyfield to Marketplace it wouldn't be very politically useful for current government it being located in a Greens seat where its a Labor vs Green race. Frosty wrote: In thinking of the 308 the only issue with it terminating at Redfern is some locals would complain that Redfern has poor wheelchair access & is not very friendly for less mobile people. A few 305 trips currently terminate at Redfern. The excuse could be "you can interchange for another wheelchair accessible citybound bus"
Seriously, despite the efforts of TfNSW in recent years to curtail low patronage routes and trying to consolidate resources into major trunk routes, there's still heaps to be done. Nah, leave the 308 alone. Truncate one of the other ones. I get the reasoning but the 308 is like the last bus in front of Redfern station that travels directly into the City (that is, NOT ending at Railway Sq like everything else), its nice to have that alternate option. Everything else was basically cut short to Railway Sq back in October 2015's changes. If anything, these days, we need more buses that cross the city, not less. Interchanging has its own disadvantages not to be forgotten (rain, losing your seat, risk of delay or cancellation, etc + transfer discount isn't a good enough incentive in my view). TSS Region 6 3809 has a Transit Systems sticker with a Tfnsw (light blue) background above the door, while the bus body itself is still the old STA livery. marcnut1996 wrote: TSS Region 6 3809 has a Transit Systems sticker with a Tfnsw (light blue) background above the door, while the bus body itself is still the old STA livery. There are a number of buses that have this issue. I think I've seen every combination possible using white, red and blue stickers and buses. This is the problem I (along with many others who need accessible lifts/services) have with TfNSW is that they don't clearly understand the issues that face people with disabilities and using public transport. Only having one lift at Redfern is a major slap in the face. I do honestly believe they could add a second lift to the platforms that service the Illawarra/sutherland/cronula services at Redfern and there is somewhat room for a possible lift on the platforms that service the bankstown line (I suspect there is a willing not to do this given the Bankstown line is due to be converted to the new Metro southwest), but the lack of trying to fix the gap and height differences between the trains and platforms are still existent and don't seem to want to be fixed or placed into the too hard basket. That has to change immediately! Transferring from one bus to another in a wheelchair is absolutely frustrating, annoying, nuts even (if you can even get one one) and shows both a lack of understanding and planning on TfNSW part! Stu wrote: - Lay over space at Burwood Westfield in its current state would not support routes 415 & 492 terminating here. It would be possible to have a proposed service from Chiswick to Burwood terminate in Railway Pde as there is plenty of room there. Just had a thought - why don't they revert the 466 to not run via Bayview Park, and instead send 415 or 492 (or both!) to Bayview Park instead? Probably plenty of termination spots there - though the Parramatta Road junction could cause issues? ?